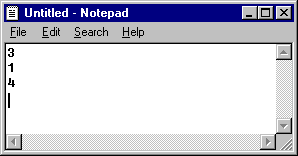 First, create a file in Notepad containing three integers separated by some whitespace. Save it as "3nums.txt" in the same folder as your code. Then write a program that reads three integers from the file 3nums.txt and displays (on the screen) the total of the integers. Reading numbers from file "3nums.txt"... done.